Closed ALL My EUR/USD Positions! Aaaand I’m out! Thanks to NFP-related volatility, my adjusted stop loss got hit and took me out with a total gain of +415 pips. Yasss!!! If you’re just tuning in, you should know that I’ve been buying EUR/USD for almost a month now, starting with rising 0.5% of my account at 1.1475 and then adding another position at 1.1710 when the pair extended its uptrend against the Greenback. Then, last week I told you guys that I’m adjusting my stops ahead of the NFP. I raised my stops to 1.1750 and raised it even further to 1.1800 hours before the release. See, I did a little digging and found out that EUR/USD’s NFP candles tend to move by only 40-55 pips, so I figured a 75-pip SL (from the 1.1870-ish top) is good enough to withstand the initial volatility. And good thing I moved the stops! Seems like a relatively strong NFP was all the dollar bulls needed to push EUR/USD lower. The pair would have hit my 1.1750 initial SL before showing a bit of bounce! Closed all positions at 1.1800 for a total of +415 pips (+0.83%) with a 1.66:1 reward-to-risk ratio. Not exactly the move to 1.2000 that I was aiming for but still, not bad for a couple of weeks’ worth of trades, huh? One thing I could’ve done better is to add more positions at better prices. As you can see, I mostly used buy stops as entries. I could have maximized the uptrend by entering at rising trend line retests especially since there was no big catalyst that threatened the general trend at the time. I could have ended up with more pips! But, hey, a win is still a win! I’m now keeping my eyes peeled for the next opportunity. Got any major dollar setups that are catching your attention these days? Did EUR/USD just break above a triangle? Here’s how I’m trading the euro and dollar this week. Adjusting My EUR/USD Trade Before the ECB Event! I’ve decided to make adjustments to my open position ahead of the ECB decision and presser! Here’s the plan. With EUR/USD’s short-term uptrend still intact, I’m thinking of adding another position to maximize the move. Here are the deets! 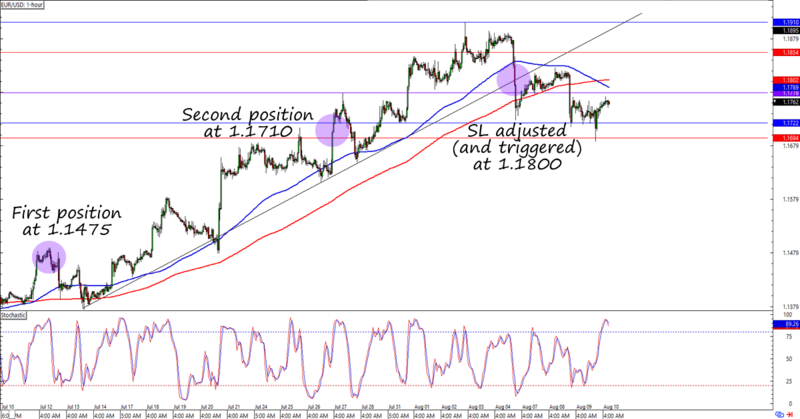 Tightening My EUR/USD Stops Ahead of NFP! My EUR/USD positions are doing well, but I think it’s time to protect my profits ahead of the monster NFP reports. Here’s my plan!